Gordon Hayward’s wife shared this on her Instagram on Monday. Absolutely genius move from this kid who I’m guessing lives in the same neighborhood. I think we all know the wonders one Gatorade can do after a night of drinking. Really gives you that athlete mentality when you’re horizontal on the couch. 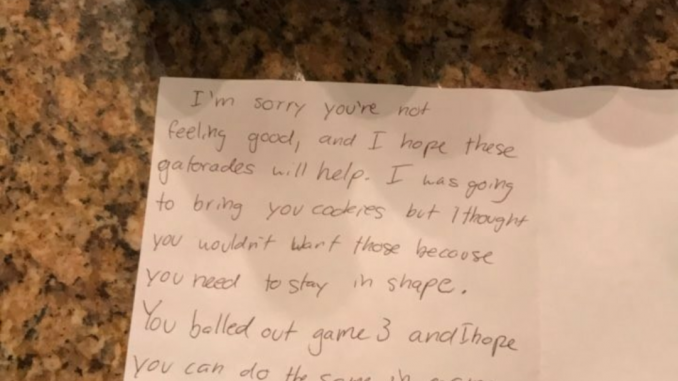 And the kid having the idea to not bring cookies so he can stay in shape? Another smart move. I like cookies. I’m out of shape. Transitive property: cookies aren’t good for you. Hayward did “ball out” in Game 3 scoring 40 points. Now, with a fresh pack of blue Gatorade? 50 points. Minimum. You heard it here first. This kid is going places. 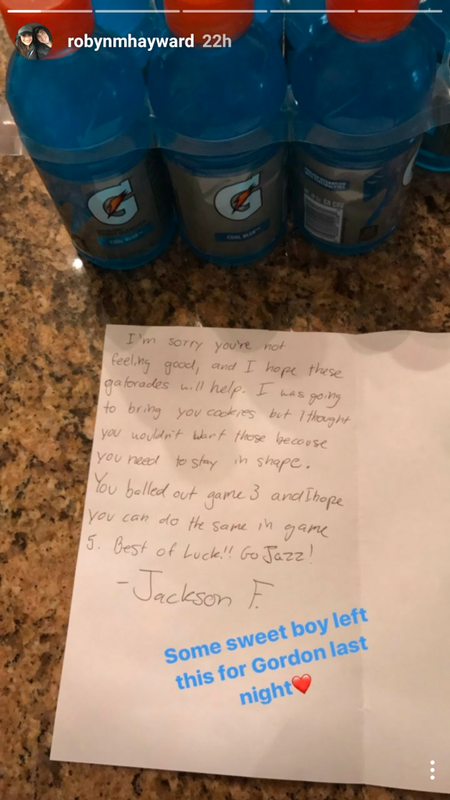 Jackson F., wherever you are, thank you. This food poisoning thing, though, what is it with the Jazz and food poisoning in the playoffs? (Yes, I’m staying woke on Jordan’s “flu”) Must have been planted from someone within the Clippers, right? I’d like to know what sandwich it was too. Please tell, Gordon. I can’t risk food poisoning either. 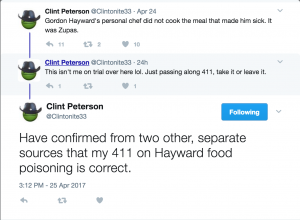 After some not so difficult internet sleuthing, our man Clint Peterson claims it was Zupas, not his personal chef. Gordon, this is the PLAYOFFS, no cheat meals.